It's not easy being a tea party lady on a budget. But it is possible to create a setting elegant enough for even the most demanding TPL, without spending a whole lot of money. This was important to me, because I didn't want lack of funds to stifle my inner TPL! I needed to find ways to make things pretty and satisfy my TPL, without breaking my budget. Some creativity was required, however, and a bit of time. My mom was a closet recipe freak. She had more recipe books than god. Well, I guess god wouldn't need recipe books, would she? heheh. ANYway, when mom died, I inherited her books, and I had no idea there were so many. I've been slowly pouring through them to find some recipes and ideas for Mother's Day, which, since I wanted to do something special in honor of my absent mother, should be something she would enjoy. This is an easy recipe that I love to serve for afternoon tea. It makes 4 dozen small cookies, so what I usually do is make 4 flavors, a dozen of each. My nieces loved to help make these in different shapes, though they sometimes got carried away with the sugar on top. Oh I'm a happy camper, yes I am. My packages arrived this morning, and of course, I had to make myself a cuppa right away. Hubby wasn't at all happy about more gadgets on the kitchen counter, but he soothed right down when I handed him a cup of this delish stuff. Wicked, eh? 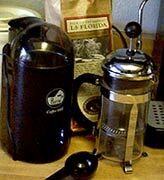 I love the Florida coffee - it has a wonderful light nutty flavor - and the french press wasn't as hard to use as I thought. The challenge will be getting the ratio of coffee to water just right. But I have all day to practice! Many people discover their inner Tea Party Lady during childhood. There's a favorite picture of mine that I'll post here, showing children having a tea party. I remember envying other children who talked about having tea parties and who had homes and toys and dishes and such. But we never stayed in one place very long, and when we left a place, we were often fleeing and had to leave toys and clothes behind. So the idea of having a tea set, and a table, and other pretty things, was quite foreign to me. I didn't really understand the joy of a tea party, or the concept of the Tea Party Lady, until much later. The first Tea Party Lady in my life went almost completely unrecognized, I'm sad to say, until long after her death. My grandma, Anita Mabel, born in 1912, somehow held herself together through childhood neglect and abuse, an alcoholic husband, poverty during the depression. She was a survivor, no doubt about it, but she never got to enjoy being a Tea Party Lady. 35 years we've been celebrating earth day? I never remember this stuff, so thank god Google and Yahoo keep me up to date on what's happening. Yahoo even has a list of things we can do to help save our earth. Be sure to check out the Earth Day photos, they're beeyootiful. I feel a little guilty that I don't do more toward saving our planet. I do recycle everything I possibly can. Food, coffee grounds and tea leaves go into the garden or compost. Our area finally has recycled materials being picked up by the city, which makes it much easier to recycle plastic, paper and glass. I used to be big into crafting with recycled materials, but I don't do that much anymore now that the nieces have grown up. And I don't leave the house if I can possibly help it, so I'm not contributing much to the gas / pollution issue. So I guess I'm doing my little 2 bits. But I leave the parade marching and speech making and crusading and soapboxing to others who have more energy.